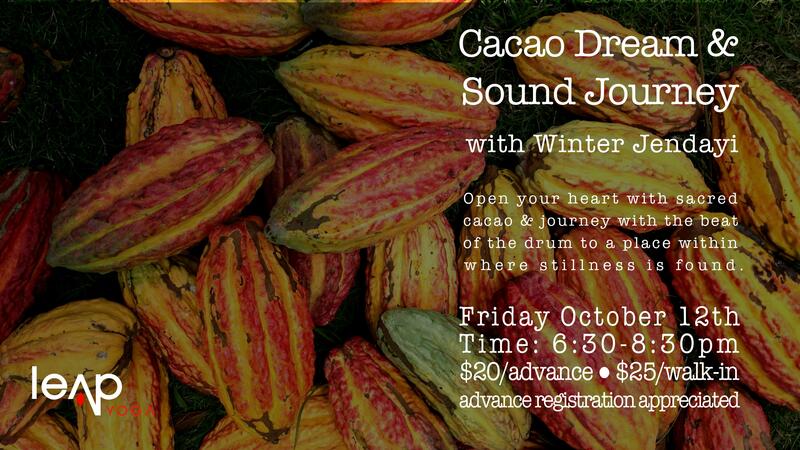 Open your heart with sacred cacao and journey with the beat of the drum to a place within where stillness is found. In this place there is knowing, and we find surrender allowing ourselves to explore new dimensions, carried by the wings of music and purified by healing plants. In this space we find healing; cultivating trust in our allies as we receive insight and clarity from this realm to bring back with us into our daily lives. Held in a ceremonial space, this offering combines shamanic journeying, sacred songs, and sound healing. The majority of our journey will be spent lying down as we are guided on a dream journey into other realms. Cacao, commonly used in and known as chocolate, is a medicinal plant from Central and South America which is traditionally used in ceremonies and assists in opening the heart. Winter uses only medicinal-grade cacao sourced from a women’s collective in Guatemala. Shamanic journeying uses drum beats as a tool to induce alpha and theta brain waves guiding one into a deep state of relaxation and meditation. In this state, intuition is awakened, allowing access to symbols and memories which offer clarity, soul guidance and connection with inner wisdom.